Andria has been with S-kape from the very beginning in guest services, then as a nail tech, and now as a stylist since 2012. She trained in our associate program under April and was a complete natural! She loves to meet new people and having the ability to make people feel beautiful and relaxed. She enjoys all aspects of hair, especially big/fun changes and long hair. 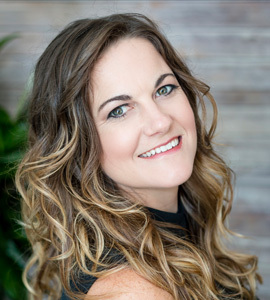 “I am very meticulous and strive to give each client their own unique look and offer recommendations and education about the best products to keep their hair looking beautiful.” When Andria is not at the salon she is raising her three beautiful children with her husband, she enjoys horses, all animals, boating and family time. Andria serves guests on Tuesdays 8:30-2:30, Thursdays 1-9. Fridays 8:30-5:30, and most Saturdays 8-4.